For my birthday, my roommate Ariana got me the book “The Definitive Guide to the Stuff White People Like.” Not only is the book hilarious (as you may have judged by the title), it is also astoundingly accurate. It’s kind of disappointing though because all of the things that I thought made me unique, just so happen to be characteristic of the entire Caucasian population. My uniqueness is really the taste of millions…sad face. This being said, one of my first lunches in New York was a Roasted Cauliflower Sandwich from Num Pang Sandwich Shop (Ohh, and the book also states the white persons love for all things pertaining to New York—living in it, talking about it, visiting it, ect..,—how much more unoriginal can I get?). 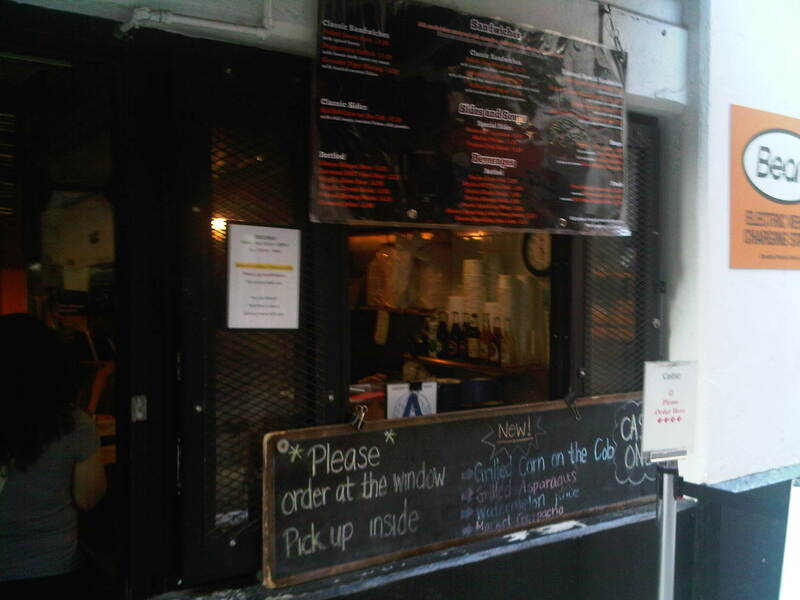 Num Pang serves up fresh Cambodian cuisine from a small, walk-up ordering window located on 21 East 12th Street between 5th and University. The sandwich wasn’t really expensive (only cost $6.75) but I did wait about 25-30 minutes to get it, so it can be classified as a typical “white person” sandwich experience. The Roasted Cauliflower Sandwich comes with Cucumber, Pickled Carrots, Cilantro, Chinese and Thai Eggplant Spread, and Soy Milk Chili-Mayo baked on bread made by Parisi Bakery. The vegetables were crisp and fresh, and the spreads packed a ton of flavor. I don’t normally like cilantro, but in this case, I LOVED it!! Devouring my sandwich, al fresco!! As you can see by the photo, the sandwich is about the size of your hand (unless you have really big hands, then that’s another story), and it is stacked high, so open wide. Ohh, and do yourself a favor and don’t forget to grab some napkins, because the spicy mayo is delicious in your mouth but not so pretty on your blouse. This place is the definition of a hole in the wall, and remember that it only accepts cash!! Although there is some limited seating upstairs, I chose to eat outdoors a la curbside—very al fresco! 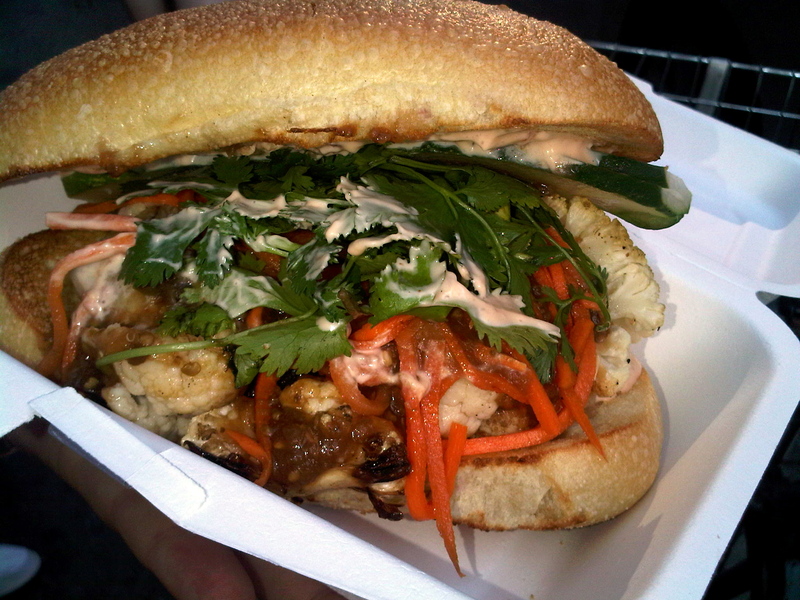 Please, please, please make your way over to Num Pang and try their delicious food!! It is absolutely awesome, so do not let yourself be intimidated by the thought of trying Cambodian food—you will not be disappointed. In addition to the roasted cauliflower sandwich, I also hear that their Pork Belly Sandwich and Skirt Steak Sandwich are very good. I can’t wait for my next trip to New York to try more of their food!